Purchase cards below. It’s fast, easy and the perfect gift for everyone who enjoys a gift card accepted at an endless variety of places. If you need cards immediately, visit a local retail location listed on this page. DOLLAR-FOR-DOLLAR VALUE – NO COST FOR USE. We often get requests to purchase “packs” or multiple gift cards. Local businesses have recognized the value of an A La Carte gift card for employee incentives, holiday gifts, giveaways for company outings, raffles and much more. It’s the gift that employees, customers and vendors will appreciate. Businesses have the option to purchase cards online or have them delivered directly to your doorstep. * We invite you to contact Alexis Gray at 603-781-4926 or email at agray@portsmouthalacarte.com. * Please contact us for personal delivery and minimum card purchase parameters. The A La Carte program has been a great success at our shop. We consistently see customers using the card month after month and and we feel that participating in the program helps Portsmouth’s image as a shopping & dining destination. We’re very happy to be a part of it. 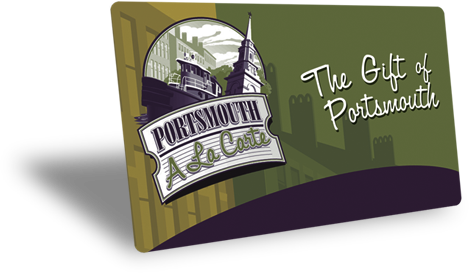 we hope you’ll direct them to any of these vendors of Portsmouth’s Official Gift Card.